Late last night, I joked about scrapping 90% of my current wardrobe and starting over from scratch. Ever since then, I cannot stop thinking about it. It didn't always look this way (proof 1 and 2), but ever since I had Jude, my closet has become overwhelmingly messy. My clothes have taken over. Truly, I'm cringing about posting this photo, but I can feel that I've lost control. I honestly feel like I should be on the tv Hoarders! 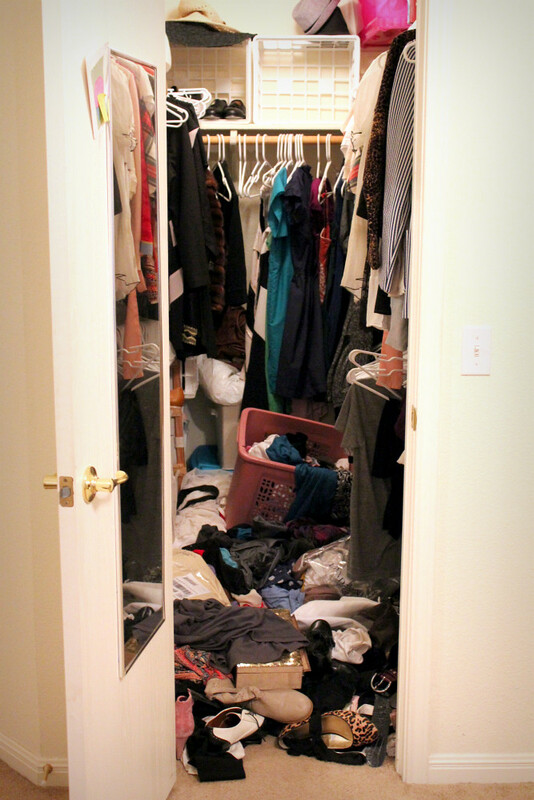 My laundry room looks the same, and my closet is spilling over into my bedroom now. I even have clothes stashed in my guest room closet, my office, and our fall coat closet. Most of these are clothes from thrift stores or things I've had since college and have kept them thinking, "Oh, it still fits and it's still in great condition, so I'll just hang on to it." I am very scared. I can't find matching shoes, I've lost my favorite belt, and I haven't seen my short, black slip in ages. So I'm doing it. I've posted this photo as a BEFORE. I'm purging and I'm making a solemn promise to myself, my husband, and my readers that I will never, ever let this happen again. Now someone send in the bulldozer and excavation team! This time next week, expect me to show you a completely different photo. I'm using Kendi's guides to get things done. [see purging, assessing, and organizing]. Afterward, I'll do one trip to Buffalo Exchange and donate the rest to Savers. From here on out, I will let things go. You cannot even believe how nervous I am. Style Station still rocks my world!